Established in 2015, Summer Land Camel Farm is an 850-acre property in the pristine Scenic Rim of Queensland, just 45 minutes outside of Brisbane. Summer Land Camel Dairy is the largest commercial-scale Camel Dairy operation outside of the Middle East and the third largest of its kind in the world. Their farming practices, animal care and product manufacturing maintain the highest global standards and commitment to quality. Summer Land Camel Co. focus on ethical, sustainable and organic farming principles. Over 550 Australian camels graze on their lush native pastures grown in volcanic mineral rich soil. Most of Summer Land camels are brought in from the wild in Central Australia, where they would otherwise be inhumanely culled. Summer Land Camel Co. want their customers to experience the richness and beauty of their camel farm through their products. 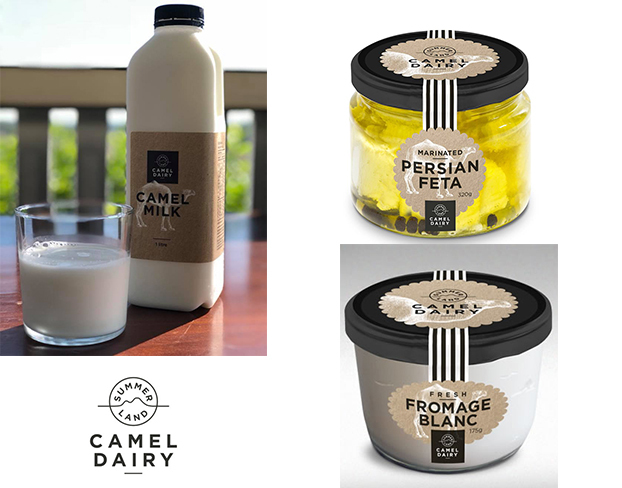 Summer Land save camels and support human health with the Camel milk they collect and the dairy products they have created including Marinated Camel Feta, Camel Milk Fromage and Camel Milk Haloumi. Summer Land care for their camels with world first low stress handling techniques to minimise stress, ensure the herd structure is respected and the mother and calf bond is maintained throughout. Their herd is loved and nurtured by a team led by one of the world’s leading Camelid Veterinarians using holistic health care techniques. Place your Pre-Order TODAY to secure stock from our first order or ask your sales team for more information! NUTRITIOUS: Camel milk contains up to 10 x more immune proteins and more vitamins and minerals than any other milk. EASILY DIGESTED: Camel milk’s composition is closer to human milk than any other milk. HEALTHY FATS & ACIDS: Camel milk contains omegas 3, 6, 9 and alpha hydroxy acids. LACTOSE INTOLERANT: Suitable dairy alternative. Camel milk is the only animal milk containing no beta casein. ANTI-AGING: Camel milk is a potent anti-aging and anti-oxident cell regenerator. IMMUNE BOOSTER: Camel milk has potent anti-inflammatory healing benefits for gut, skin and hair.